The Crisson Gold Mine is an open pit hard rock mine. It has been worked commercially on and off since 1847. It is one of the Original Gold Mines in the Dahlonega area. The Crisson Mine digs the quartz rock out of their mine, and then they crush the quartz rock with their 130 year old Stamp mill. 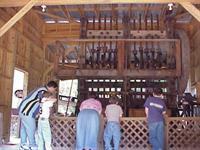 It is the only working stamp mill in the state of Georgia. You can see the stamp mill in the self-guided tour that comes with the purchase of your admission or the purchase of your buckets you want to pan through. Crisson Mine is set up to accommodate the beginner to the professional gold panner young and old alike. You can buy their Ore by the pan, Bucket, or even by the Tractor scoop. They have High bankers, and trommels set up for you to use to use. Just like the ones you see on the T.V. show GOLD RUSH. If you would like to find a substantial amount of gold that’s the place to go. 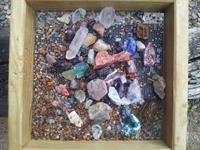 For the Gemstone hunters they do offer Gemstone Buckets to search through, everyone will find some. This is especially fun for the Kids. The wagon ride they offer is also great for the kids. It’s a 15 minute ride. You will see an old mining tunnel, hydraulic water cannon, and you will even pass by the pit they are still mining out of. You will also see lots of animals, and antique farming equipment. The wagon ride is going weather permitting. We are Just 2 1/2 miles north of Dahlonega's town square on US HWY 19 and 60.